Findlay Customs Teams Up With Findlay Toyota Flagstaff to Kick Off The Ultimate Tailgating Tundra Project! You are here: Home → Findlay Customs Teams Up With Findlay Toyota Flagstaff to Kick Off The Ultimate Tailgating Tundra Project! Join us as we celebrate the launch of our web series dedicated to this amazing upgrade and customization project! Recently, Findlay Customs unveiled the Ultimate Tailgating Tundra project. This month, we’re teaming up with Findlay Toyota Flagstaff to bring our fans the ultimate tailgating experience. First things first, we laid out the parts we know we want to use and began designing a plan to install them and upgrade the vehicle. It didn’t take long for our team of professionals to envision the ultimate experience and get to work. This week, we fitted the bed-slide, which will be used to allow access to the grill and ice coolers when the vehicle is parked. We also began welding it into a custom frame that will help secure the batteries, power inverter, chests, sound, and wiring. 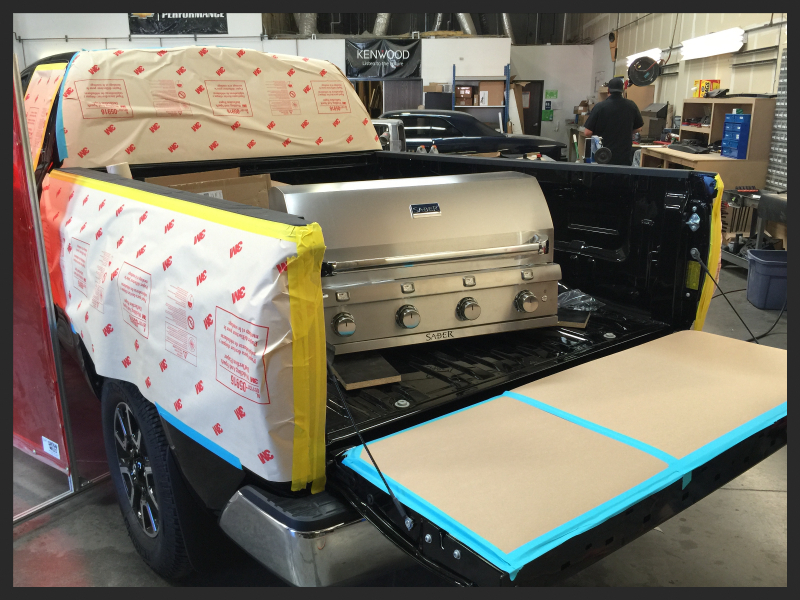 We also began fabricating the frame and installing it into the bed of the truck! Take a look at some of the progress below! Step one was to place the equipment and decide where and how to install it. To prevent damage while the ruck is in the shop, we wrapped and cushioned all of the most venerable areas. Once we finalized the arrangement in the bed, it was time to begin fitting the bedside and fabricating the frame that will hold everything in place. In the photos above, one of our professional fabricators tweaked the OEM bedside to make it fit and function for our use. Next, we need the frame. The first step was to measure and place temporarily, so that final tweaks could be made. Once we were happy with the design, our techs began welding the steel frame into place. When this are is complete, it will house several batteries, a power unit, sound, and any wiring that needs to stay out of view. We wouldn’t be here if it weren’t for you. Thanks to all our fans for your trust and support over the years! We look forward to bringing you more exciting updates as we complete this amazing upgrade package! Previous Post Findlay Customs Presents: St. Patty’s Day 2015!